The room was dinghy, not cleaned properly and was more like the staff quarters. The swimming pool was tiny and sunbeds cramped and the breakfast was pitiful and mean. The staff were off hand. The only positive point was the hotel was located right on the beach. The town centre was a 10 minute walk away.We certainly from our experience would not revisit or recommend. Hotel is basic ,but ok.Good position right on beach.Basically you get what you pay for with this place.As a budget holiday i would say its ok ,but i wouldn't recommend.Everything seemed to be just ok,but nothing special.Breakfast is a roll and cup of coffee.Rooms cleaned everyday,but not very well.The bathroom is a shower in a cupboard.No internet access(brochure and sign outside hotel say they have it,but they don't.I don't want to be too negative as i said earlier its ok for a budget holiday,but if i payed brochure prices i would have been disappointed. We decided to late at n named accommodation for a holiday in later September. what a mistake we made but choosing the Kordistos Hotel. Whilst one side did face the beach the other backed directly onto the main road which could be noisy especially at night. The room was a reasonable size but the bathroom was tiny and really dark I think they had a small really low wattage bulb. The room was cleaned but very badly. The same dirty patch was there from our first day to our last. Our sheets and pillow cases were not changed once. You would think that coming towards the end of the season the hotel would respond to complaints but the owners were full of smiles but did nothing about it. As for breakfast the least said the better a roll and butter was all you got and the British guests were defiantly discriminated against as other nationalities at least got an egg, a piece of cheese and an egg. The swimming pool and surrounding area was nowhere as big as it looked in the brochure, a clever optical illusion. We certainly would not consider returning here and from experience would suggest others considered carefully before booking. One final point the safe deposit box which was actually a small tray was a con. It held very little, items could easily slip down the back and it was very expensive. The hotel was lovely, staff were great, and the pool was great. The accommodation and breakfast must rate as one of the poorest we have encountered. Our room was not the worst as some on lower ground floor were like dark prison cells. It reminded us of the cell in television programme Bad Girls. Our room faced onto the main road out of the resort of Kefalos and consequently we were kept awake at night but passing traffic especially motor bikes who seemed to use the road in the early hours as a race track. The rooms themselves size-wise were average but there was no drawer space and the bathroom had virtually no lighting was the toilet was literally in the shower! !Cleaning was done most days but it was only cosmetic. I do not think our room was cleaned properly in a fortnight. Our bedding was not changed once. Breakfast was a farce we only got a small roll and butter to eat and the restaurant manager was rude and authoritative. From our experience we could not recommend the Kordistos hotel in any shape or form. For us the Kordistos Hotel was a disaster and we were pleased to leave. We were on the ground floor not far from reception and we suffered both from noise from guests in the reception area and traffic from the road outside. The rooms were small and the standard of cleaning was abysmal. No television in the room and few other facilities. All we got to eat for breakfast was a small roll and butter and you were best to avoid eating anything in the restaurant area as the standard of cooking would have given Gordon Ramsey a field day. The bar was lacking in atmosphere and comfort although the bar staff were friendly. Overall compared with some other accommodation in Kefalos which we looked the Kordistos hotel rooms were by far the worst. we would only classify it as 1* rating. Breakfast was pitiful and overall we got the impression the owners were rather money grabbing. One side of the hotel faced the beach and the other the main road so traffic noise was a problem at night. This is a Budget price hotel so only expect to get what you pay for. The hotel is situated right on the beach and has a great swimming pool. The staff are friendly and the rooms are very basic and small but clean. 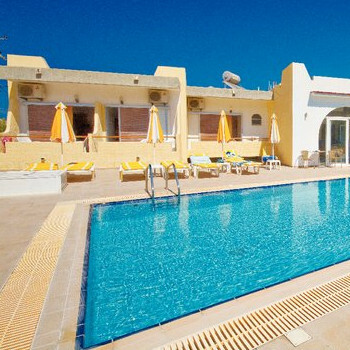 The Kordistos hotel is in a quiet and prime position right by the beach. There is a small amount of traffic noise from the road behind. The rooms were very clean and typically what you would expect from Greek accommodation. The drainage in the bathroom was a slight problem. The swimming pool area was great as was the poolside bar. We went on bed and breakfast but forget the breakfast as it was small and very basic. The staff were very friendly and took every opportunity in a nice way to spend money in their hotel the they were even nicer. This was especially the case with extras for breakfast, you could not survive on what they gave you without spending more. We can otherwise highly recommend this hotel. It was absolutely brilliant everyone is really friendly lots to do. I have been three times and am already booked up for next year.